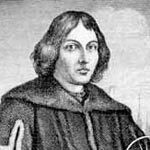 Nicolaus Copernicus (1473 – 1543) – Polish / Prussian mathematician and astronomer. Copernicus created a model of the universe which placed the sun at the centre of the universe (heliocentrism) – challenging the prevailing orthodoxy of the time – which believed the earth at the centre of the universe. His major work De revolutionibus orbium coelestium (1543) (On the Revolutions of the Celestial Spheres) was published just before his death and marked an important scientific landmark – it was a key moment in the scientific revolution of the Renaissance period. As well as being a pioneering astronomer, Copernicus excelled in many different fields – he was a practising physician, economist, diplomat, scholar and gained a doctorate in canon law. Copernicus was born 19 February 1473, in the city of Thorn in the province of Royal Prussia – the Kingdom of Poland. [Copernicus would likely have considered himself Prussian.] His father was a wealthy merchant, who was also politically active in supporting Poland against the Teutonic Order, and he played a leading role in peace negotiations between the two factions. His mother’s family were also very wealthy and influential making Copernicus well connected throughout his life. After the death of his father, Copernicus was given a full education by his maternal uncle. Copernicus became prolific in several languages, including spoken Latin, German, Polish, Greek and Italian. He studied at the Cathedral School at Wloclawek and the University of Krakow. Copernicus’ studies included astronomy and mathematics, Aristotelian philosophy and Aristotelian natural-sciences. Copernicus supplemented his studies with his own private reading, including works by Euclid, Pythagoras, Plutarch, Ptolemy and many works related to astronomy. In 1496, Copernicus left to the University of Bologne Italy, where he studied Canon Law with a view to a career in the church. After completing his studies, he temporarily succeeded to the Warmia Canonry. However, he was never fully ordained as a priest and turned away from Canon law – preferring the humanities which were of greater interest to him. Copernicus also began making an increasing number of astronomical observations, such as the lunar eclipse of 1500. It was through his close studies and astronomical observations that he began to increasingly develop a different view of the Universe to which most people held at the time. In addition, to these studies, he became a practising physicist and would perform operations on many significant people throughout his life. In 1503, Copernicus returned to Poland where he served as secretary to his uncle who was the Prince-Bishop of Warmia. In this capacity, he also became involved in diplomatic negotiations over the ongoing tensions between Prussia and the Teutonic Order. 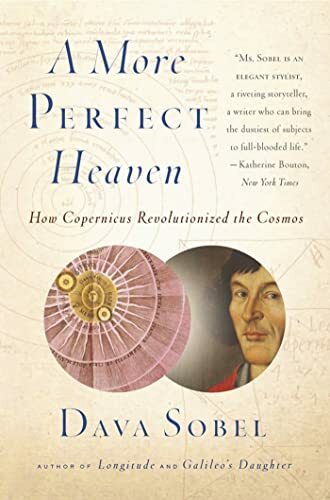 Copernicus was broadly supportive of the humanist movement, which sought to offer a more liberal approach to life, literature and the sciences. He printed translations of Greek literature, which showed his support for more a more liberal approach to non-Christian literature. After the death of his uncle, Copernicus moved to Frombrook, in the Kingdom of Poland where he continued to make more astronomical observations, such as viewing Mars, Saturn and the earth’s eccentricity in relation to the movement to the stars; he used fairly primitive instruments and telescopes in these observations. These observations continued to inform and develop his heliocentric view of the universe. He shared his radical ideas and observations in private letters but held back from publishing because he feared receiving criticism and scorn for his revolutionary new theories. 1. There is no one centre of all the celestial circles or spheres. 2. The centre of the earth is not the centre of the universe, but only of gravity and of the lunar sphere. 3. All the spheres revolve about the sun as their midpoint, and therefore the sun is the centre of the universe. He was very reluctant to publish, despite some favourable interest shown by friends and even the Pope and Catholic cardinals in the Vatican. However, encouraged by friends, students and elements within the Church, he finally published in 1543, the year of his death. He died on 24 May 1543 – one story says that on the very day he died, he awoke from a coma to view his life’s work finally printed – before dying peacefully in his sleep. Amongst his many achievements, Copernicus was also a pioneering economist. He developed a theory on the value of money (later became known as Gresham’s Law – the idea that bad (debased money) drives out good money. In 1517, he created the first attempt at a quantity theory of money – Inflation was related to the amount of money in circulation; this became a principal element of economic theory. It was important for that particular time period, where governments struggled with currency devaluation. His writings on economics became influential for both Prussia and Germany (Teutonic states). For sixty years after his death, only a small number of astronomers and intellectuals accepted Copernicus’s heliocentric viewpoint. However, on the publication of his thesis, there was little controversy and no real criticism from the church. There were theological objections from leading figures in the Protestant Reformation, such as Martin Luther and John Calvin. The Protestant Reformation placed biblical scripture as the ultimate authority and rejected Copernicism for the perceived conflict with Biblical sources. However, by 1616, more objections from Catholic church were being made. Members of the Inquisition, such as Francesco Ingoli wrote Copernicism was theologically heretical. Galileo’s (1564-1642) work in astronomy made him come to the conclusion Copernicus was right. In particular, it was Galileo (with the use of improved telescopes) who found moons orbiting the planet Jupiter; this was a justification for Copernicus’ view. But as Galileo advanced the view of heliocentrism, he received considerable opposition from the Catholic Church, and he became convicted of heresy on the basis that heliocentrism was contrary to the sense and authority of Holy Scripture. Galileo was placed under house arrest for many years. But, Galileo played a key role in seeing heliocentrism accepted as scientific fact. Copernicus’ De revolutionibus and Galileo’s Dialogue Concerning the Two Chief World Systems were placed on the Catholic Church’s prohibited list until 1835. The Copernican Revolution is said to be the period from 1543 to the time of Isaac Newton and his works on gravity. Citation: Pettinger, Tejvan. “Biography of Nicolaus Copernicus”, Oxford, www.biographyonline.net 28th March 2015. Scientists – Famous scientists from Aristotle and Archimedes to Albert Einstein and Charles Darwin. 100 most influential people – A list of 100 most influential people as chosen by Michael H. Hast.